cafes and restaurants to the local community, which the architect belongs to. Pedro, thank you for your input. I note that your email address is @kpf. I believe that Kohn Pedersen Fox (KPF) are the architects retained for this proposal? Headquartered in New York. Not Vauxhall. Although your London offices are at 7 Langley Street in Covent Garden, ironically in an attractive refurbished low level Victorian building not unlike the Beer Bottling Store. Not for you a glass tower in the sky. Unfortunately the design, in our opinion, is still a fifty story monstrosity, unlike the St George’s Tower, which although tall actually looks attractive. The architects and builders of the original Beer Bottling Store actually knew something about design and aesthetics that the current bunch, hell bent on turning a substantial profit, do not. It will be yet another ugly wind tunnel. Far better to restore the old Bottling Store. But I guess there’s no money in that. Soon Vauxhall will look like every new development in the UK and its 19th century character will be lost forever under a pile of concrete and glass. And I still believe that the people who will make money out of this and other similar follies will be living in Kensington, Chelsea, Richmond Barnes, Hampstead, and of course New York – not Lambeth. You don’t need to build something so tall and so hideous to add cafe’s and restaurants to the area, or to remove the Gyratory. Only an opinion of course. Dear Asbo. 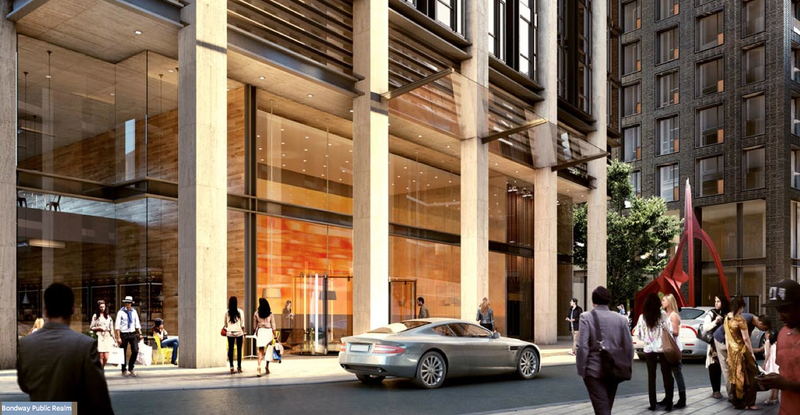 I am indeed working at KPF London , and work as a key member of the design team for the project. I live in the heart of the community ( Tradescant road, Vauxhall, London,and not New york) and have done for a decade, I am also a member of Friends of the Vauxhall park, I thoroughly enjoy the area, and truly believe that the development will bring lots of benefits to the current and new residents. I feel sorry that you feel so strongly against the design, and you are perfectly entitled to have that opinion. I would like to point out that the VNEB development area was designated as an opportunity area, with a cluster of tall buildings years ago ,a policy decision that was taken at a government level and involving the GLA and two boroughs. It is not to up to the architect or the developers to influence or change those already taken decisions. I invite you to come to the public exhibition of the proposal to be held on Thursday and Saturday next week at the market towers, where you can have the chance of learning about the proposal first hand from everyone in the team, and to voice your concerns as well. Best regards. Pedro, Thank you for your kind invitation to the public exhibition, which we have already detailed in our blog, although clearly it will be for information only, the views of the public having long since been trashed. In referring to the height (which I accept has been agreed by the local authorities and public bodies, largely against the wishes of the local community, so no change there) you miss the main point – the design is hideous. It looks as if the architects simply stacked glass boxes one on top of the other, but some of them slipped when it got too top heavy. And you are replacing what could be a beautifully restored Victorian building (not dissimilar to KPF’s London offices – or do you have plans to relocate to the new building? ), part of our heritage. I doubt we will be saying that about your proposed New Bondway Tower in one hundred and fifty years. Again, just an opinion. I’m sure we will see you at the exhibition.